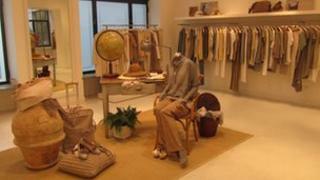 There are no price tags on the clothes in Brunello Cucinelli's showroom in Milan. The people who shop in the designer's store do not need to worry about how much they are spending. And Mr Cucinelli doesn't feel he needs to worry about talk of a double-dip recession in Europe. "This is the century of China," he says. "This will mean billions of human beings coming towards us and asking to live in a different way. These people are fascinated by our quality, by our culture, by our craftsmanship." Too true, says Italy's luxury goods trade group Altagamma. It sees sales in European markets growing by 3.75% next year. It is in Asia, though, where the real growth will come, with 16.5% growth, the company forecasts. "I don't think a Chinese man does not want to drink French champagne or wear a Swiss watch," says Mr Cucinelli. Europe has its "own identity and we are moving towards a splendid century". The Italian government's debt is the second highest in the eurozone. Worse, it is getting more expensive for it to borrow, as lenders are charging the country more interest to do so. Because of that, Italy needs to reduce its spending to bring down its borrowing costs. And not just for its own good, but - as one of Europe's largest economies - it needs to do so for the good of the eurozone as a whole. Italy's debt woes are adding to the pressures on all countries using the euro. Stefano Pozzi, 36, believes he is a living example of how Italy's government cuts are affecting ordinary people. He should have a solid teaching career ahead of - and for that matter behind - him by now. With a teaching degree, a PhD and a string of qualifications, you would have thought he would be snapped up. But cuts in education, designed to help reduce the national debt, mean he can only find temporary work. "It's humiliating," he says with a shrug. "There are many others in my position. "There are classrooms in the first year that are over-filled. More than 30 in a classroom, and many headmasters have complained to the government because the classrooms are not legally fit to contain such a number." So how would he save money? "I think the cuts must be made in other sectors, like the payment of our politicians, which are the most high in Europe. "Cutting education is not the right way of behaving, cutting the future of the next generation." In a workshop nearby, that most Italian of accessories is being revved up. Simone Caldera owns a scooter and motorbike repairs and sales business, which is doing less well right now. People are not buying the higher-end vehicles. Sales of the cheaper scooters from Asia, though, are holding up well. For him, the way to kick start the economy is simple. "Up to now, government subsidies worked well," he says. "We had a good contribution from the state. You could get up to a third off, and that helped us sell more scooters." For many, though, that is precisely the problem with economies like Italy's. Too much reliance on state support. In the opulent heart of Milan it is hard to see the economic crisis. Still harder perhaps to feel it. In front of the famous cathedral under a bright autumn sun, white stretch limousines drive up, one after the other. Out of each spills a wedding party of excited Chinese-Italians, here to grab a slice of La Dolce Vita. Each bride drapes herself over the bonnet for the photographers. But venture just off the main square and into the famous neighbouring ornate arcade and you realise appearances are deceptive. "Things aren't good at all," says Elenor Galli who runs her family's restaurant here. "We are suffering from a very bad crisis which started in 2008, and had its worst setback this year." Business, she says, is down 30% since the start of the year, and is half what it was this time last year. She blames the fact that fewer people are coming to Milan, and those that do come are spending less. And she has a warning: "Rome is the political capital - but Milan has always been the economic capital. "Milan has been able to stand up to all the crises, but now we have the feeling that we have more difficulties than ever." That should worry the world's leaders as they head for the G20 at Cannes. If Italy's affluent engine is stalling, where's growth going to come from? Because without it - this debt crisis will only worsen.